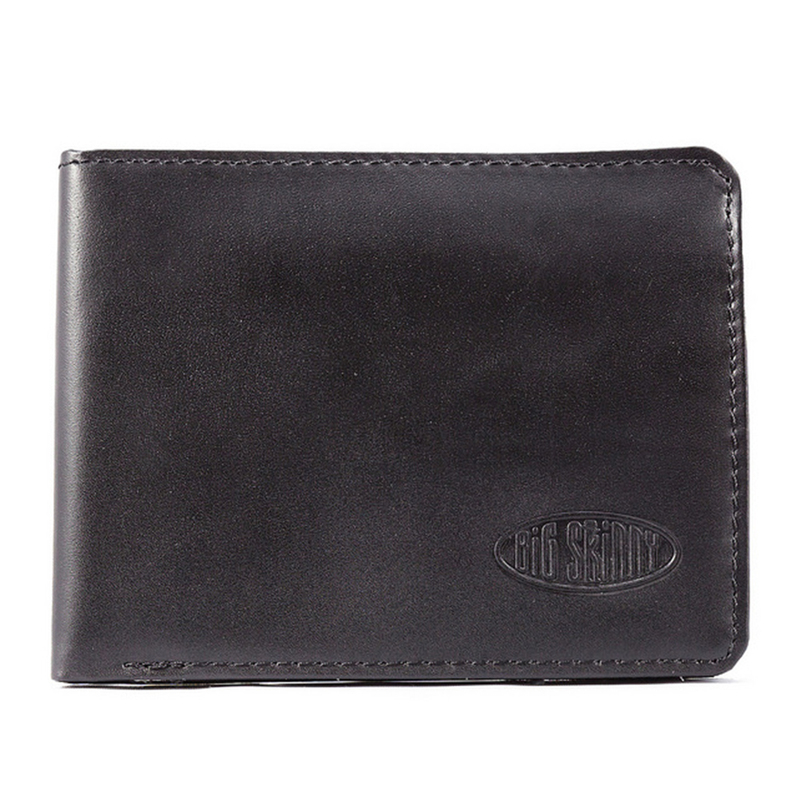 Give identity thieves a run for their money by protecting your cash and credit cards in an RFID blocking leather bi-fold wallet. 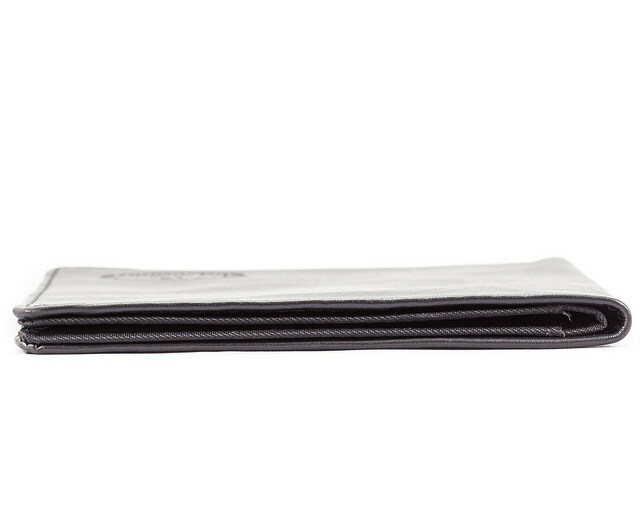 Big Skinny's best-selling bi-fold design has gotten a tech boost with a built-in RFID blocking liner. Customers told us they wanted greater security and we've delivered with the black leather RFID wallet. Now you can keep your information safe from bad guys without sacrificing style, storage or durability. 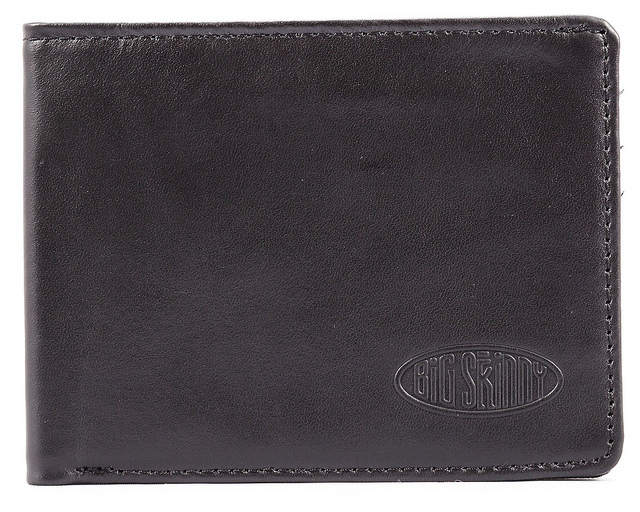 The RFID blocking leather bi-fold wallet includes a full-size billfold area and plenty of card pockets. 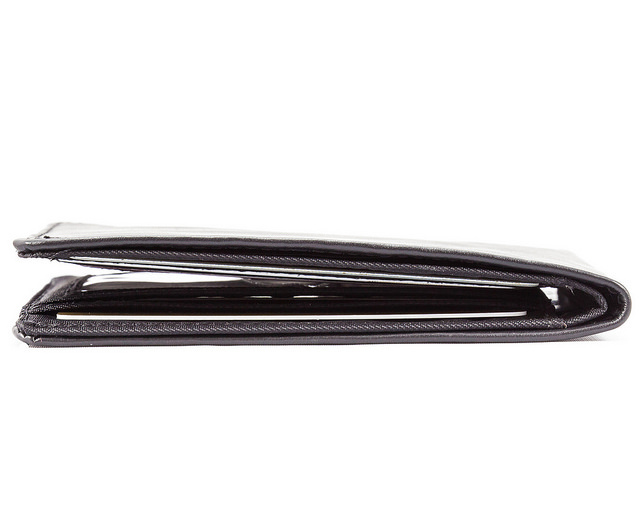 The wallet opens horizontally revealing a clear plastic ID pocket with an oval cut-out to assist in removal when necessary. 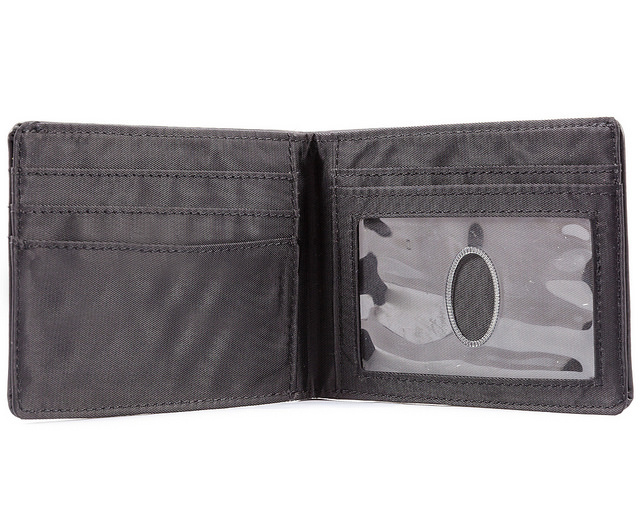 The wallet's card pockets are lined with non-slip material that keeps cards or cash from falling out. 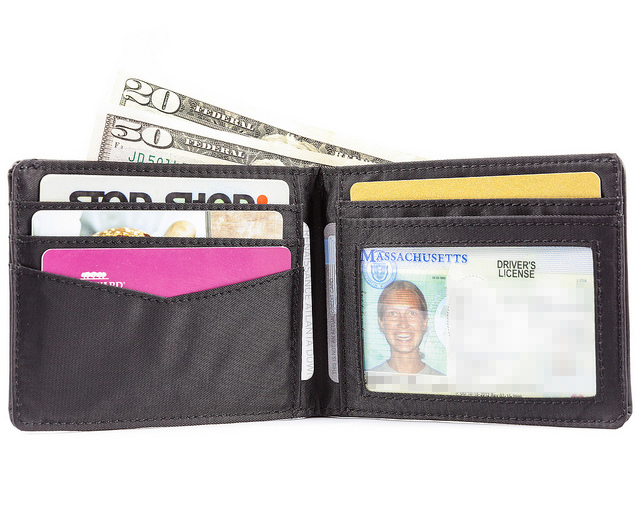 The leather wallet can hold roughly 20 to 25 plastic cards plus a ton of cash. The exterior of the wallet is made with top-grain leather with a rich black stain while the interior boasts ultra-thin and ultra-durable nylon. Matching stitching and rounded corners complete the design. This wallet is part of our hybrid series. Fewer pockets than my last one. Makes it a bit difficult. But still a good product. 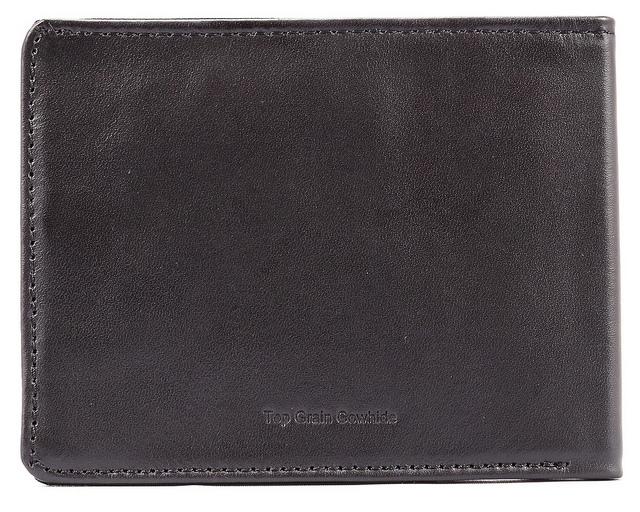 This is as close to a standard men's wallet as you'll get- but it's a Big skinny and that's what makes it great. I didn't even use this yet. I have it as my back up for the one I bought over the Summer. Merchant Response:Correctamundo MarcO! Our BigSkinny wallets are able to stay so skinny because we don't put leather on the inside - only millimeters thin nylon microfiber :)! ConsVinyl inside. I wish that was leather as well. Maybe that keeps it skinny? This is my second such wallet and I find it very user friendly. Thin with all the space that you need. Light and durable. Highly recommended! ProsThin, comfortable with plenty is space to fit your credit cards and dollar bills. I loved my first one so much, I wore it out! Bought another one without even thinking about it. Can’t even feel the wallet! Wallet is nicely made. Is about 1/2 as thick as what I was wearing. I often check to make sure it�€™s even back there. I carry my ID and about 10 cards and it�€™s still thinner than any traditional wallet. This is my second wallet from Big Skinny and both have been of excellent quality. The only reason that I am replacing my first wallet is because I am traveling to and have concerns about security so I upgraded to one with RFID technology. My credit cards fit in the wallet easily and the wallets thin profile reduces bulk. The craftsmanship is awesome so I'm passing along my first one to my son. This is my second Big Skinny purchase and I am well pleased. Reading previous ratings, I knew not to expect the wallet to be very skinny because of the RFID materials imbedded in it. I am especially pleased with the credit card pocket feature the holds the credit cards in place. Although sometimes it works so well that I need a little extra oomph to get it out. I'd rather have that than to have the cards constantly falling out of the pocket. That was a problem I had with my first Big Skinny. I had to keep each pocket stuffed full to prevent 'fallout.' Not a problem any more with the new wallet. Can't say enough good things. I should mention I place my wallet in a side pants pocket, rather than a rear pocket. This is his 2nd one as he wore out the 1st one and wanted a RFID Blocking wallet this time. I keep too much stuff in my wallet - that's on me. Big Skinny makes it look like I keep a normal amount of things in it! !